In an effort to make things more exciting, NASCAR recently changed how they do qualifying for Talladega. 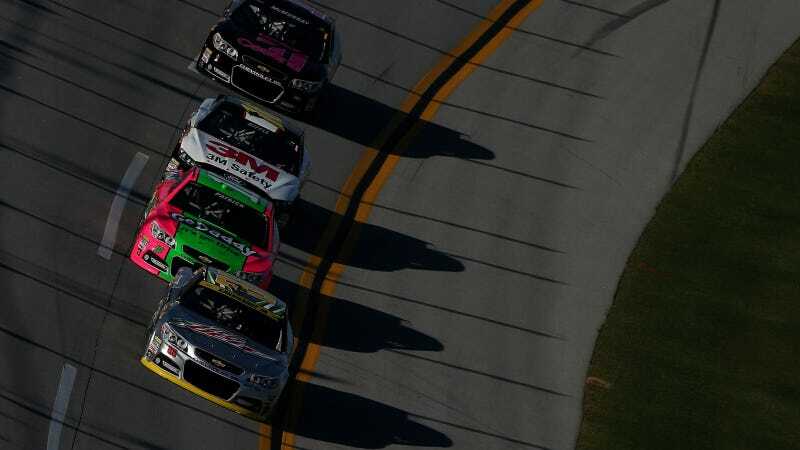 Problem is, the back of the pack at a track like Talladega is the fastest place to run, so we got the bizarre situation of racers not racing for position. Man, if I changed things around just for the sake of shaking things up as much as professional racing series did, my 944 would have sharks with frickin' laser beams tied to its roof. Because excitement. Three rounds with the first round divided into two groups amongst the competitors. The first qualifying round is five minutes in length for each group. • Competitors will be assigned to a first qualifying round group based on the random draw held earlier in the event. • The 24 eligible competitors that post the fastest single lap speed from either of the first qualifying round groups will advance to the second round. The remaining competitors will be sorted based on their speed posted in the first round of qualifying in descending order. • There will be a 10-minute break after the completion of the first qualifying round and the 24 remaining competitors that advance to the second round will have their times reset. • The second qualifying round is five minutes in length and the 12 eligible competitors that post the fastest single lap speed will advance to the third and final round. • The fastest remaining competitors will earn positions 13-24 based on their fastest single lap speed posted in qualifying in descending order. • Following a five minute break, the 12 eligible competitors that advance to the final round will have their posted speeds reset. • The final qualifying round is five minutes in length and the fastest single lap speed will determine positions 1-12 in descending order. It wasn't exciting in the least bit at Talladega, though. This format meant that the fastest car at Talladega was the one at the back of the pack. Drivers sat in their cars for the first few minutes, waiting for other cars to go out first. It became a race to the back of the pack: the challenge became to stay at the back to draft in the wake of all the other cars while still posting the fastest lap. Drivers such as Denny Hamlin who said "screw it" and went out early took a hefty penalty. Hamlin was cut in the first round of qualifying because everyone behind him was faster. Starting position matters less on a superspeedway like Talladega, but the coveted first pit stall is a nice perk. Brian Vickers qualified on pole with a speed of 196.129 mph. Jimmie Johnson starts in second place, which should help his chances at avoiding elimination after this round. While positions 1 through 36 were based on how well the racers did at not racing each other, positions 37 through 42 were assigned based on drivers' points. Many popular names ended up here in this provisional area: Denny Hamlin, Joey Logano, Kevin Harvick, Kyle Larson, Kyle Busch and Tony Stewart. Justin Allgaier and Ricky Stenhouse, Jr., failed to make the grid altogether. Reed Sorenson was almost eliminated after qualifying as well but made the 36th spot when Joe Nemechek's car failed a post-race inspection. Nemechek's car had an oil tank encasement that was not properly sealed during qualifying. If the goal is to make things more exciting, this qualifying style seems like a dud. Just have them wrestle for position in Jell-O or something at this point. It's too bizarre to see racers not racing at a race event. The Draft-O-Rama qualifying style seems like the NASCAR equivalent of a hypermiling contest: yes, it takes skill and concentration, but you're only really going to get a few moments of utter madness that translate well into good TV. Formerly, single-car qualifying was the rule at Talladega. Sure, sending packs of cars to qualify out seems like it should be more interesting, but it still encourages folks not to actually race. In the immortal words of Ricky Bobby, "I wanna go fast!" Surprise, surprise, fans would like to see that, too.